Blog - Recovery Made Easy....and Tasty!! 1. 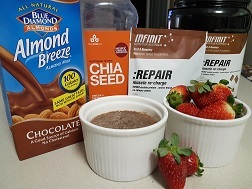 Mix 1 scoop Infinit Repair with dark chocolate almond milk in a mason jar. 2. Add Chia Seeds to jar, shake to mix, and let sit for 5-10 minutes. 3. Shake jar (this helps prevent clumping) and chill in the fridge for at least 3 hours or overnight. If possible, shake the jar every couple of hours. 4. Shake or stir well before serving. 5. OPTIONAL: Serve garnished with dark chocolate shavings and/or fruit of your choice (we love berries with this recipe!) 6. Enjoy! !